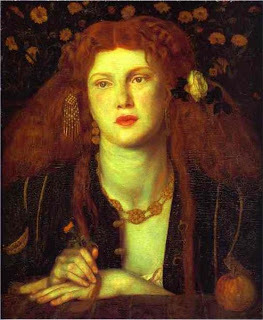 The images on this page are of the pre-Raphaelite models Jane Morris and Elizabeth Siddal, the latter a poet who may have been the inspiration for the female vampire Lucy Westenra in Bram Stoker's novel Dracula. 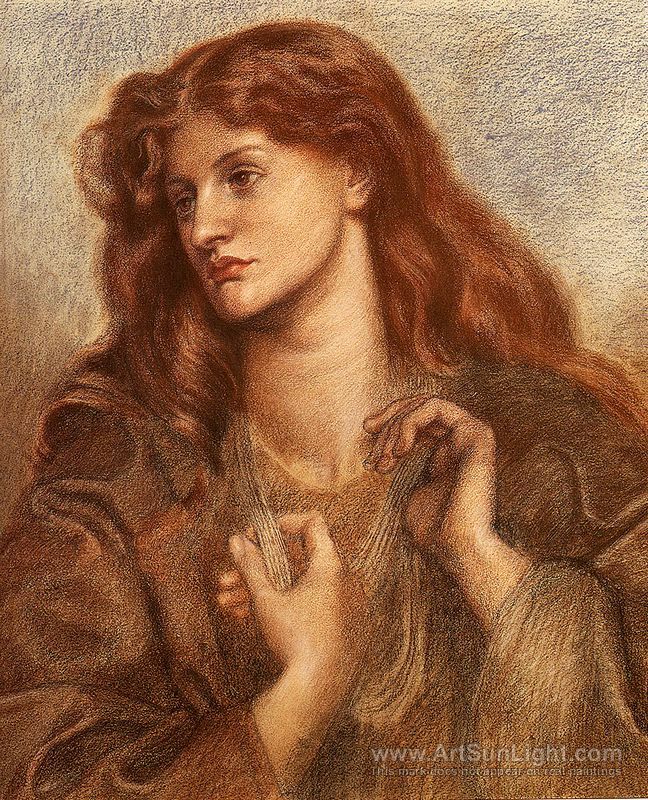 Elizabeth Siddal's poems appear on this page, along with her life (and death) story. 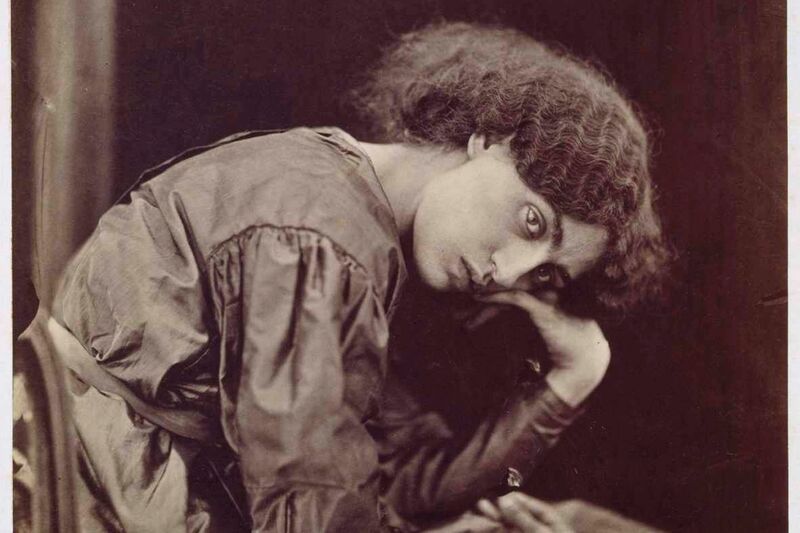 Jane Morris and Elizabeth Siddal may have been the first supermodels. Honorable Mention: "Les Metamorphoses du Vampire" by Charles Baudelaire, "Le Vampire" by Charles Baudelaire, "Lenore/Lenora" by Gottfried August Bürger as translated by Dante Gabriel Rossetti, "Der Vampire" by Heinrich August Eckenfelder, "Do Not Stand at My Grave and Weep" by Mary Elizabeth Fry, "La Morte Amoureuse" by Theophile Gautier, "The Vampire" by Jacques LeClercq, "The Vampyre" by James Clerk Maxwell, "The Unreturning" by Wilfred Owen, "Lenore" by Edgar Allan Poe, "Thalaba the Destroyer" by Robert Southey, "The Vampyre" by John Stagg, "The Vampyre of the Fens" by Unknown, "Oil and Blood" by William Butler Yeats, and William Wordsworth's Leech Gatherer in "Resolution and Independence"
Real-Life Vampires: Vlad Tepes II was known as "Vlad the Impaler" and "Dracul." His son, Vlad III, would be known by the diminutive "Drăculea" or the anglicized "Dracula." Elizabeth Bathory, a Hungarian countess, has also been proposed as a female vampire. She has been deemed to be the most prolific female murderer, by the Guinness Book of World Records. There are accounts that she bathed in the blood of her victims in an attempt to remain young. She has been called the Blood Countess and Countess Dracula. According to "Dracula: Sense and Nonsense" by Elizabeth Miller, in 1890 the novelist Bram Stoker read a book about the bloody lords of Wallachia, part of present-day Romania and adjacent to Transylvania. Although the book did not mention Vlad III by name, Stoker was struck by the word "Dracula." He wrote in his notes, "in Wallachian language means DEVIL." It is therefore possible that Stoker chose to name his character Dracula for the word's devilish associations. The name Dracula means "Son of the Dragon." Vlad III was said to have dipped his bread in the blood of his victims, so that could be where the legend of Wallachian blood drinkers began. Have driven our perverse and aimless band. Freedom to all from love and fear and lust. Our life-sick hearts and turn them into dust. Here's something you don't see every day: just in time for Halloween, a vampire poem that I wrote many years ago has gone viral ... on a French website ... in an Anglais book ... read by someone with a "burry" Scottish voice! So we have an American poet, a Scottish performer, an English book, and a French bookstore website. The poem is its own ecumenical movement! If you'd like to hear the poem read, please click on this link then scroll down and click on "Poem written by Michael R. Burch" (the poem appears below in the text version). sunlight, or a stake, or a cross—such common things. we shrink from his voice. and feels the ancient soul-tormenting pangs. But only the trees moaning overhead. From frozen lips shut still and dumb. And to comfort me with his love so strong? Bending me down to a living death. 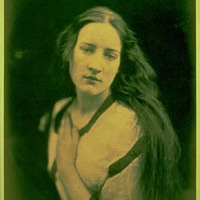 Elizabeth Eleanor Siddal (1829-1862), in addition to having been a poet and artist, may have been the first supermodel! Was she also the the first female vampire? 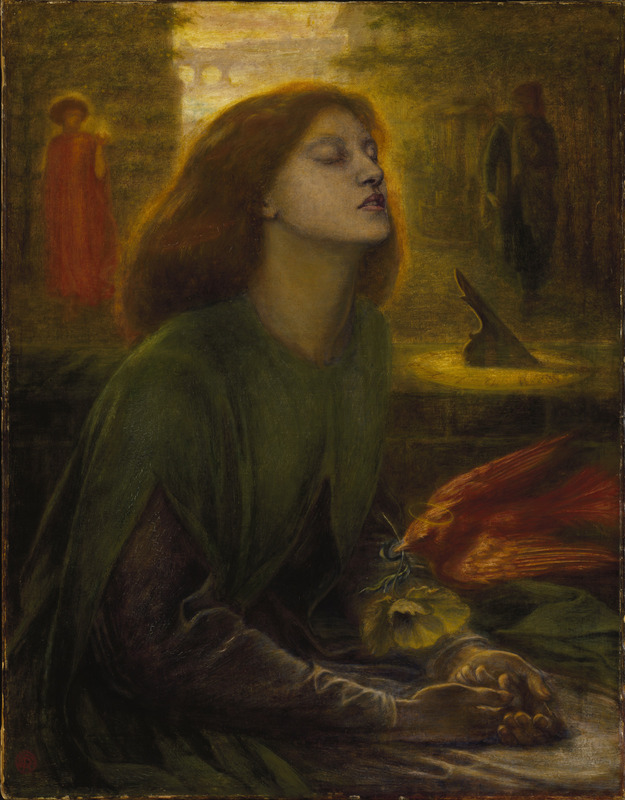 Lizzie Siddal developed a love for poetry at a young age, after having discovered a Tennyson poem on a scrap of newspaper that had been used to wrap a pat of butter; the discovery was an inspiration for her to start writing her own poems. 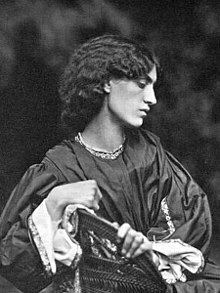 Around 1849 and age 20, she was employed as an artist's model by Walter Howell Deverell and through him was introduced to the other Pre-Raphaelites, including her future husband, Dante Gabriel Rossetti. Her first modeling job was to sit as Viola for Deverell's "Twelfth Night" painting. 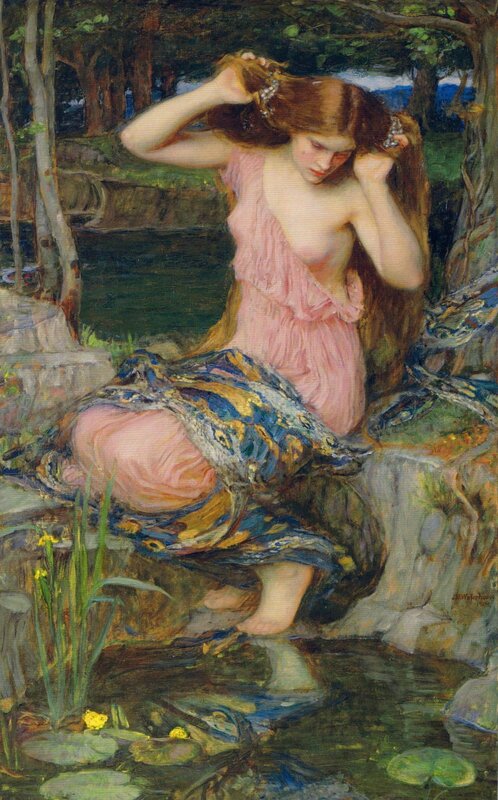 She also posed as Ophelia, painted by Sir John Everett Millais. 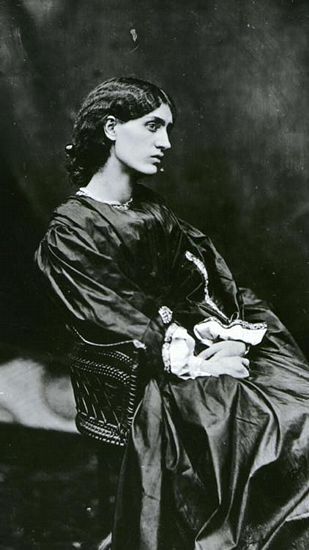 William Michael Rossetti, her brother-in-law, described her as "a most beautiful creature with an air between dignity and sweetness with something that exceeded modest self-respect and partook of disdainful reserve; tall, finely-formed with a lofty neck and regular yet somewhat uncommon features, greenish-blue unsparkling eyes, large perfect eyelids, brilliant complexion and a lavish heavy wealth of coppery golden hair." 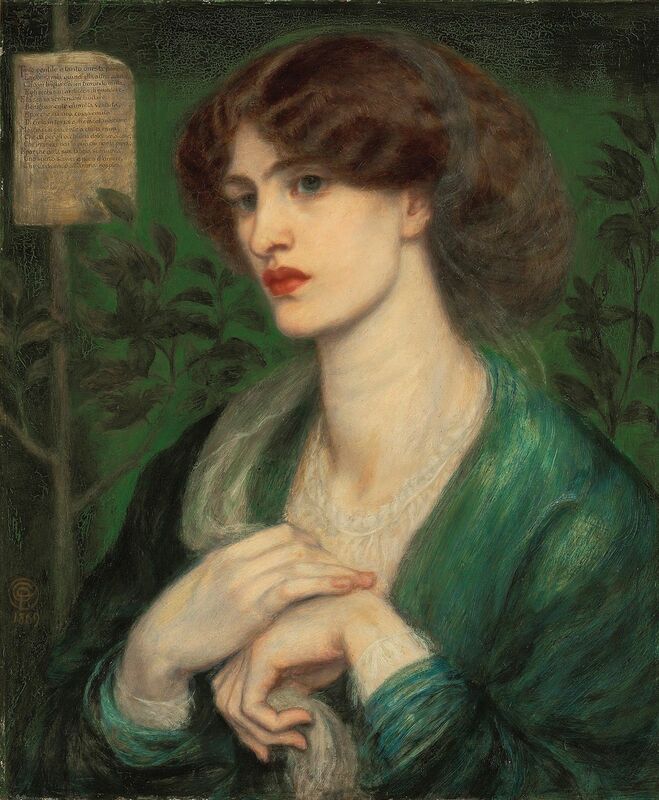 By 1851, she had become the primary model and muse of Dante Gabriel Rossetti, and also his star pupil. In 1855, John Ruskin, the leading art critic of the Victorian era, purchased all her work, declaring it better than her male counterparts', and became her patron. 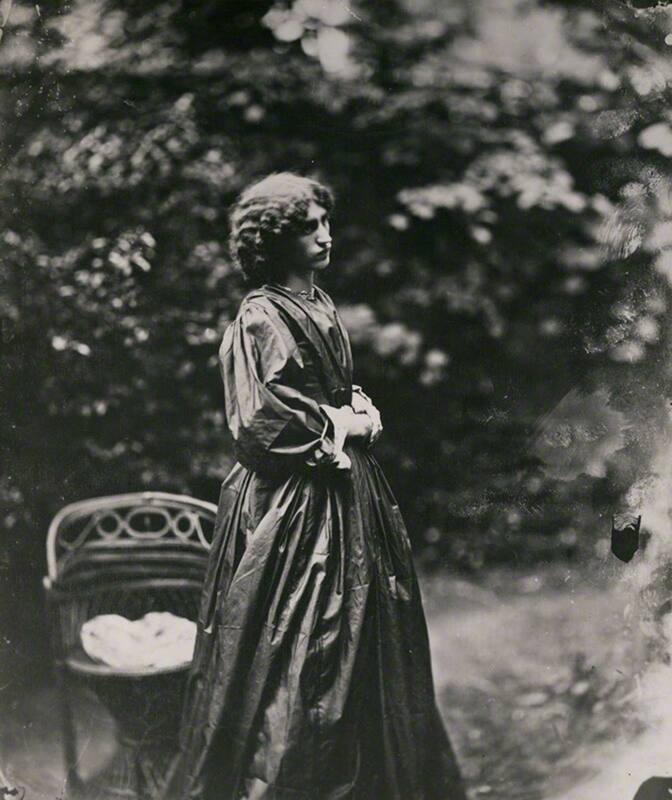 In 1857, several of her paintings and illustrations appeared in the Pre-Raphaelite Exhibition at Fitzroy Square, Marylebone, where she was the only female artist. Dante and Elizabeth married in 1860. She overdosed on laudanum in 1862, possibly a suicide, after having dinner with the poet Algernon Charles Swinburne and her husband. Dante, overcome with grief, placed the journal containing the only copies of many of his poems in her coffin. Seven years later, in 1869, her grave was exhumed so that the poems could be retrieved. 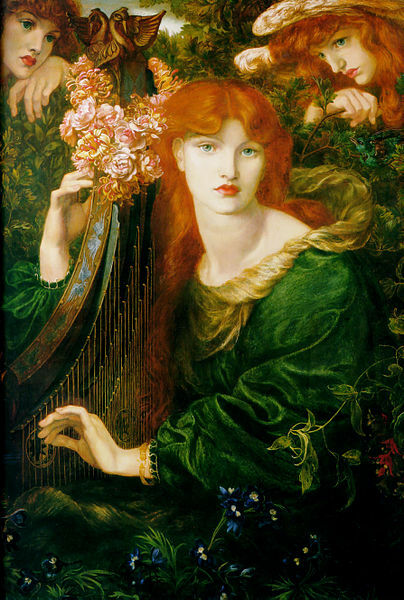 Her hair was said to have continued to grow after death so that the coffin was filled with her flowing coppery hair. Although a worm had burrowed through the book so that some of the poems were difficult to read, it was reported that her body had remained uncorrupted. It was this report of Elizabeth's unblemished "undead" appearance that has been alleged to have inspired Bam Stoker―a neighbor of the Rossettis―to conceive of the character of Lucy Westenra for his famous novel Dracula. It has also been suggested that Lucy's tomb at the fictional Kingstead Cemetery was largely based on Highgate Cemetery where Elizabeth was laid to rest. In any case, Dante did published the recovered poems along with his newer ones; they were not well received by some critics because of their eroticism, and he was haunted by the exhumation for the rest of his life. Ironically, John William Polidori, the writer of the first modern vampire story, The Vampyre, was an uncle of the three most famous Rossettis: Dante, William and Christina. And thoughts begin to swim. And nurse him on thy knee. Out of its winding sheet. That my sorrow be not known. That my spirit may not walk. And he’ll know my soul’s in heaven. And my dying heart was gay. And hide me among the graves. And take me in at last. And know thee mine at last. I live to know that she is gone. But they belong to Thee. And all is dead to me. Where some day I might sleep. The dust from thy grave. To claim his pale bride. Yet my soul has no rest. Must fly away from thee. And may not laugh again. Lest I might wake, and weep. Elizabeth Siddal as she might have appeared in her grave, with coppery hair that continued to grow even after her demise. A sight to dream of, not to tell! O shield her! shield sweet Christabel! being neither evil, nor good. they dream of us by day. to see, to touch, to feel. we warm them, growing cold. The tortures of that inward hell! That word shall wrap thy heart in flame! first exhibited at the new gallery in London in 1897. And never one fared back to me or spoke. The weak-limned hour when sick men's sighs are drained. I dreaded even a heaven with doors so chained. he says nothing that I understand. scurrying under rocks and boards. and my blood seems to pause at his touch as he caresses my face. He unfastens my dress till the white lace shows, and my neck is bared. His teeth are long, yellow and hard. His face is bearded and haggard. A wolf howls in the distance. There are no wolves in New York. I gasp. My blood is a trickle his wet tongue embraces. My heart races madly. He likes it like that. With my necklace of albatrosses. My trade of guilts and glosses. Tracks the flotsam of my losses. 'Is there anybody there?' he said. That I kept my word,' he said. Ah broken is the golden bowl! the spirit flown forever! And, Guy De Vere, hast thou no tear?—weep now or never more! "And when she fell in feeble health, ye blessed her—that she died! "That did to death the innocent that died, and died so young?" Go up to God so solemnly the dead may feel so wrong! The life still there, upon her hair—the death upon her eyes. "But waft the angel on her flight with a Pæan of old days! "Should catch the note, as it doth float up from the damnéd Earth. "From grief and groan, to a golden throne, beside the King of Heaven." The change came, and the music passed away. God frowned, and shut the village from His sight. Your blind mouth into sleep. tell Regret it is not so rare. the past is our resting place. It is the grave of Jesus, where he lay." Sleep well and see no morning, son of man. Bow hither out of heaven and see and save. From pit to crucifix, feet chill on steps from hell. The stars are caught and hived in the sun's ray? Of broken intervals ... And I, their sexton slave! The impasse high with choir. Banked voices slain! But not for long to hold each desperate choice. In wounds pledged once to hope—cleft to despair? Unseals her earth, and lifts love in its shower. Beat on the dusty shore and were obscured. The portent wound in corridors of shells. And silent answers crept across the stars. Monody shall not wake the mariner. This fabulous shadow only the sea keeps. She rose among us where we lay. She wept, we put our work away. And spread a silence there. And toss her troubled hair. And tortured hands so pale? And felt our spirits fail. A dull and nightmare size. Her fixed and burning eyes. Spirit so strange, so sinister? Slow word by anguished word. And slake my body's flame. And slimed upon with shame." Who dared not stay behind. Our eyes were red and blind. As blood in moonlight is." To perch upon the dead. Pale stones were splashed with red. And that dark voice was gone. All night long he ploughed. "Why looks my lord so deadly pale? Why fades the crimson from his cheek? What can my dearest husband ail? Thy heartfelt cares, O Herman, speak! Dost thou in sleep so sadly mourn? Griefs too distressful to be borne. "Why heaves thy breast? — why throbs thy heart? If not, at least shall share thy grief. That late with keenest lustre glow'd. Were pulling you away to death? That grief which preys upon thy heart." A fate I cannot long conceal. Wil drag me to the silent tomb!" Of this distress, and all thy care. And galls thy bosom with despair? Sure this can be no common pain? That soon thy Gertrude shall obtain." And galls my bosom with despair. Unto the silent house of death. Thy Herman he must follow too! E'en to the torture of my soul. More keen than which hell scarely knows. And dreadful haunts me in my bed! And drinks away my vital blood! And drains the fountain of my heart! O Gertrude, Gertrude! dearest wife! Till night invites him forth once more. And toss with agonizing pain! To-morrow I shall be no more! "But, O my Gertrude! dearest wife! Thy blood by Herman shall be drain'd! This shall prevent my coming forth. Until you hear my parting groan. And Herman's body shall be cold! And shew him visible to sight!" The object whom her soul ador'd. The hapless Herman he was cold! The shade of Sigismund! — sad sight! Beheld aghast th' enlight'ning glare. Distent, and fill'd with human gore! She shriek'd aloud; — then swoon'd away! All pale, a lifeless body lay! From pests like these ere 'twas too late. Still warm as life, and undecay'd. Save that all motionless he lies. Deep in the earth, a sharpen'd stake! Both quiet keep the slumb'ring tomb.